I'm surprised this term shows up much anymore. Though it's a part of history now, the following paper by Woese demonstrated the three domain system long ago. Source: Toward automatic reconstruction of a highly resolved tree of life. The phylogenetic differences between these organisms shed light that bacteria and archaebacteria were not as closely related as was initially though, hence the abolishment of Monera. As you note, "Monera" includes both Bacteria and Archaea -- but genetic analysis and molecular comparisons reveal without a shadow of a doubt that Archaea share a more recent common ancestor with Eukaryota than they do with Bacteria. Consequently, "Monera" is a paraphyletic group, not a proper taxonomic category. Thus the term has been abandoned in favor of the three domain model. Edit You'll find quite a nice explanation of this at the Wikipedia page for Monera. While modern evolutionary biology textbooks tend not to discuss the now outdated term "Monera", each of the following textbooks lays out the relation among the three domains and discusses the reasons that we avoid paraphyletic groups: Futuyma Evolution 2nd Edition, Herron and Freeman Evolutionary Analysis 5th edition, Bergstrom and Dugatkin Evolution 1st Edition, Zimmer and Emlen Evolution 1st edition, Barton et al Evolution 1st Edition. (Presumably other texts and other editions would cover the same ground). Not the answer you're looking for? Browse other questions tagged cell-biology cell prokaryotes or ask your own question. Creating a cell, not from another cell. Will it be possible? Which of the two mitochondorial membranes relate to bacteria according to the endosymbiotic theory? How does symbiogenesis explain reproduction of organelles along with the cell? 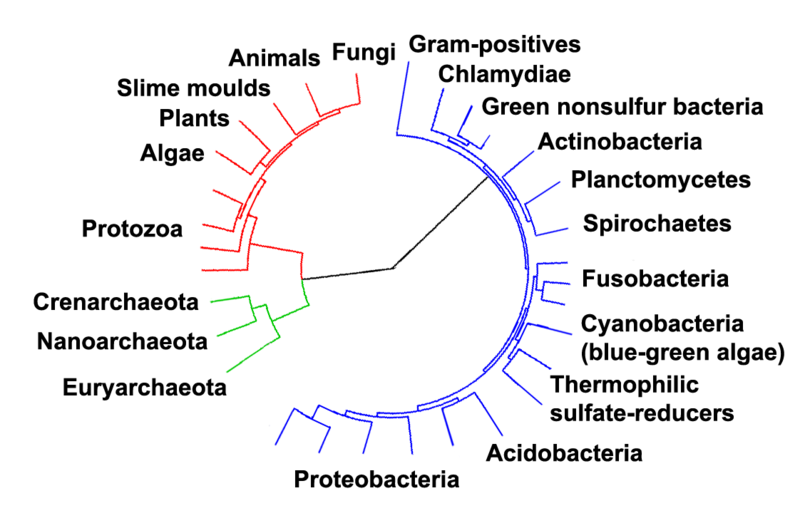 Why are archae and bacteria grouped into separate domains? How do you differenciate between the eukaryotes and prokaryotes?